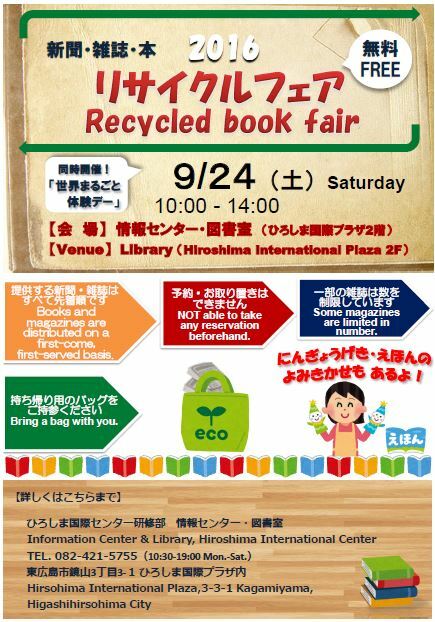 As a part of HIP’s exciting event, “The Amazing World Culture Festival”, Information Center & Library holds “Recycled Book Fair” and “Puppet show and children’s book reading” on Saturday, September 24, 2016 at Hiroshima International Plaza. 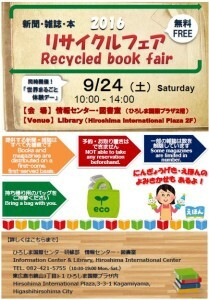 The “Recycled Book Fair” held at the library on the second floor is an event to give away newspapers and magazines in English, Spanish, Chinese, Arabic and other languages as well as books withdrawn from the library stock. From 11:00 a.m. and 1:00 p.m. at the NGO meeting room, we will hold “puppet show and children’s book reading” events in Japanese. Please come to HIP and have a great time! Copyright 2014 © 公益財団法人ひろしま国際センター. All Rights Reserved.